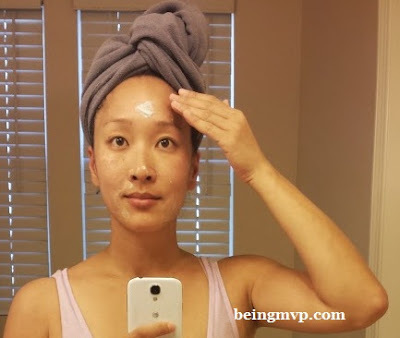 being MVP: Jabu'she Skincare & Giveaway! My skin was in dire need of some moisture because of the dry weather so I was excited to receive a few Jabu'she products for review: Moisture Mask, Eye Lift Serum and Cleansing Lotion. 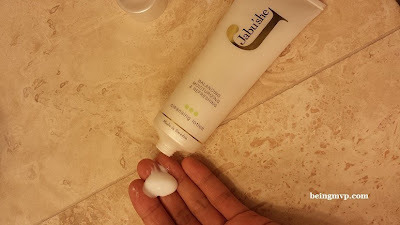 Jabu' she products are supposed to help sun damaged or aging skin so right on for me. I started with the Cleansing Lotion and the smell reminds me of the cucumber peel off mask I used when I was a teenager, very refreshing and clean. It is creamy and my face felt clean yet moisturized. There was also a feeling of firmness even after the first use which is a fantastic plus. I then applied the thick Moisture Mask on my face. It went on creamy and after 15 minutes (while I did the dishes), my face felt dry so I rinsed the mask off. (While you can leave this mask on overnight, I'm a bit hesitant in going to sleep with products that rub off onto my pillow.) When rinsing, I could tell that the mask was moisturizing as I felt my face look better than before (the puffy face look was in full force). Although I didn't feel I need anything more on my face, I applied the eye lift serum which I only needed a dab of to effectively surround my eyes. Overall, after several weeks of using the products, my face seems to have regained its brightness and start to "heal" from the moisture zapping from the sun. Buy It: You can purchase the Cleansing Lotion for $29.95, Moisture Mask for $39.95 and Eye Lift Serum for $39.95. Make sure to connect with Jabu'she on Facebook and Twitter! One Winner will Receive a Product of Choice! I would like the Anti-Wrinkle Serum. I would pick the moisture mask! I would like the 24 Hour Cream, Soft. I would choose the 24 hour cream soft too. I have very dry skin I bet this would help. I like the Anti-Wrinkle Serum. The Anti-Wrinkle Serum looks amazing! I'd like to try the 24 hour eye cream. I'd like to try the Anti-Wrinkle Serum, as well as the Eye Lift Serum. I like the Anti-Wrinkle Serum. Thanks so much for the fantastic giveaway! I would like to try the anit-wrinkle serum. i would try the moisture mask! I'd like the Moisture Mask. I'd like to try their 24 Hour Eye Cream. I'd like to try the moisture mask. Cindy B (on rc/fb) ~ The anti-wrinkle serum looks like something I'd like to try. I'd like to try the 24 hr Cream. I'd love to try the 24 Hour Cream, Original! I like the Anti-Wrinkle Serum. Thanks. So want to try the Eye Lift Serum! My eyes need a lift! The Anti-Wrinkle Serum looks very nice!